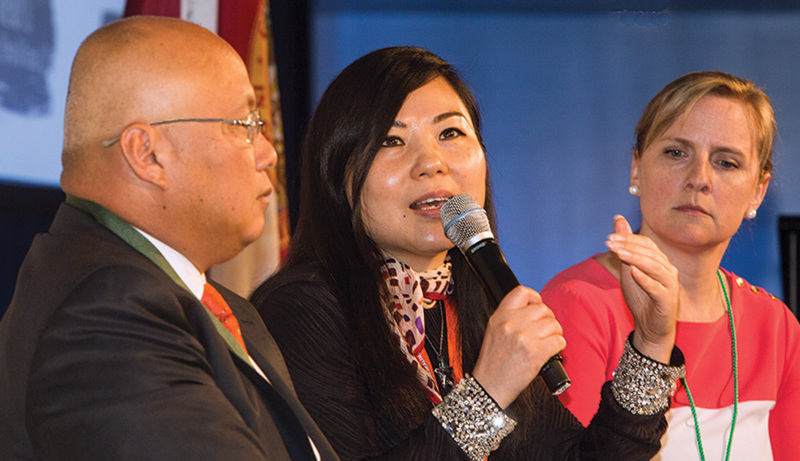 Three Asian market experts suggested that pinpoint marketing and nonstop air links may be the best ways for Miami to tap into the Chinese market while elaborating on growing Miami-China ties as a conclusion to the Greater Miami Chamber of Commerce Goals Conference. Panelists on Friday spoke of Miami’s stable and thriving business economy due to its relations with the Latin America community and their hopes that relations with the Asian market, specifically China, would be a focus. Moderator Mark Rosenberg, new chamber chairman and president of Florida International University, opened the conversation by citing the importance of the foreign investment. Attorney Wendy Li, a partner at New York-based law firm Zeichner, Ellman & Krause, who has worked with multiple financial institutions, spoke about the attracting qualities of Miami that the Chinese admire, which she said will help persuade them to do business in the city. Panelist Kristi Shalla, head of investment promotion at Invest Hong Kong in New York, said Chinese industries mainly invest in “visible and prestigious locations” and mentioned that a vital strategy for Miami to lure more foreign investments and visitors is to increase marketing. “There is a certain level of marketing that needs to be done. There are clear advantages for Miami such as shipping, and to me it is one of the most diverse cities, so marketing is a good step,” she said. Ms. Li noted that the Greater Miami Chamber has made efforts to boost Miami’s qualities in a trade mission to China. She was involved and noted its success. She spoke on how the media can disseminate information to China’s huge population of over 1 billion citizens as a marketing strategy. “The information can be very conveniently flowed through the media, no matter if it’s a movie, television or newspapers. If Miami has a wonderful relationship with the media, it could help,” she said. The third member of the panel, Robert Lee, partner at Rimon Law with offices in Miami and Orlando, gave his thoughts on visibility tactics, noting that trade missions have been very successful. He told the audience how PortMiami hosted a delegation of Hong Kong businessmen and a trade mission from China on which members admired Miami’s beauty. Mr. Lee stressed that visibility does play a role in attracting investors and that the trips help spread awareness and show that business in Miami will additionally open up other opportunities in South America. The opportunities to connect with the orient are plentiful, yet one reason for a slow rate of success is lack of a nonstop flight to Asia from Miami. Panelists spoke of how there were no nonstops from China to Miami, where typical flights from Asia would have a few stopovers in another US airport before flying to Miami from there. “We need to have that direct nonstop flight from Greater China to Miami and we are hopeful that will open up a lot of doors and we need to support that effort,” Ms. Li said. Trade trips have shown some success for North Miami, where they hope to gain an influx of economic opportunities from China after they announced this year that there will be a designated Chinatown district, following the framework of Chinatowns around the nation such as Philadelphia, with an average retail revenue of $125 million a year; Seattle, with an average retail revenue of $41 million per year; and Washington, DC, where tax assessments in 2015 were estimated at $2.5 billion. Once well-known Chinese banks establish footholds in Miami, Ms. Li predicts that more will follow, along with tourists attracted by the city’s appearance. It’s funny to read what the “experts” suggested was necessary to lure Chinese to Miami. I must be an expert then because to me it was just common sense.